In order to become acquainted with the features of CMGUI, it is useful to run through some of the simple example files provided. CMGUI is a command line driven program, and all of its features are available via a command line interface - however, it also provides a more accessible GUI interface allowing many (but not all!) of these commands to be executed via a more familiar graphical interface. The interface is broken up into a number of windows that allow access to the different functions of the program. The first example will familiarise you with the most commonly used windows. The CMGUI examples with thumbnails can be obtained from the CMISS website at http://cmiss.bioeng.auckland.ac.nz/development/examples/a/index_thumbs.html - These examples normally consist of a comfile and some other data files for creating a mesh. Load CMGUI to begin the first example. 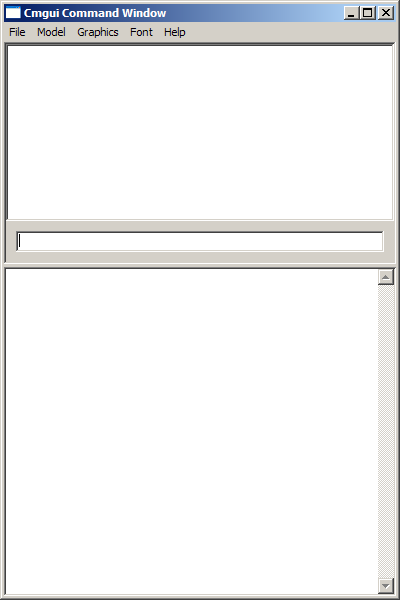 The first window that will present itself when loading CMGUI is the command window. This window has a selection of menus and three functional areas; a history area which shows commands that have been executed, a command line where commands may be entered directly, and an output area that shows the text output of any commands, including error and help messages. In the file menu, select Open then Com file, then locate the example-a1.com file. This is a text file containing all the commands used in this example, as well as useful comments on what the various commands are doing. You will see the comfile window appear, displaying the file you have just loaded. All the lines that begin with a # character are explanatory comments, the rest are commands. The comfile window has three buttons at the bottom - the All button executes the entire comfile, while the Selected button will execute only selected portions. Close closes the comfile. Individual commands from the comfile can be executed by double clicking on them - notice that clicking to select a command in the comfile window makes that command appear in the command line panel in the command window, and clicking again then executes it. It is important to note that the order the commands are executed in can be important, especially in later examples, so click on the commands in the order they appear in the example comfile. 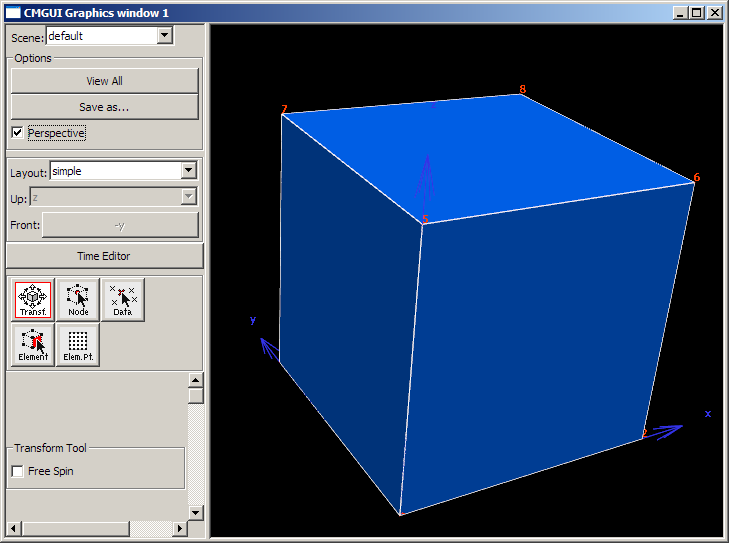 Double-click the first two commands in the comfile - a new window will appear, displaying a wireframe representation of a cube. This is the graphics window. You can rotate, zoom and translate the view of the cube in this window by holding down the left, right and middle mouse buttons respectively while moving the mouse in the display area. Have a go at moving the cube around, and click the perspective button on and off to see the difference it makes to the display. To reset the view, click the View All button. Once you have run through all of the commands in this example (either by double-clicking them or by using the All button in the comfile window) you should have a blue, somewhat shiny cube, a set of blue axes, and red numbers at each corner of the cube. These are the numbers of the nodes, the points that make up the 3D model. Another window will also have appeared, called the Node Viewer. This window allows you to manipulate the data that define the nodes - in this case the corners of the cube. In the cube example, each node has a number and coordinates. You can click on each of these buttons (at this stage a small GUI bug means you need to manually resize the window after clicking) to show editable boxes containing the actual data contained in the nodes. This window therefore allows direct access to the node data for editing. If you edit coordinate data and click the Apply button, you will see changes in the shape of the cube in the graphics window. That is the end of the example file commands, but there are other windows you can now use to manipulate the cube shown in the graphics window. Go into the Graphics menu in the Command Window, and select Material editor. This brings up a window that allows you to create and edit materials, which define the appearance of objects in the graphics window. You can manipulate the colour, specularity (shininess), emitted light (glow), and alpha (transparency) of a material using this window. Your edited material is used to create the sphere in the preview panel at the bottom of the window - you may need to resize the window in order to get a good sized preview panel. Click on some of the already defined materials in the list at the top to see how they affect the preview sphere, then play around with the sliders to alter the material. Click on the material bluey - this is the material used to show the faces of the cube in this first example, as defined in the comfile. Use the colour and property sliders to make it quite different; perhaps red and highly transparent, then click Apply to change the cube in the graphics window to your new material. 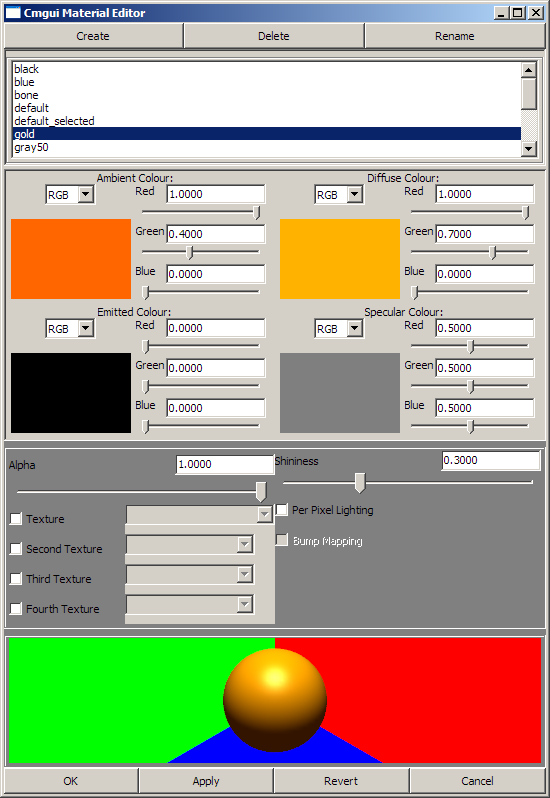 Now close the material editor and go to the Graphics menu, selecting Scene editor. The scene editor allows you to manipulate which objects appear in the graphics window, and how they are rendered. It also allows you to create new objects, as well as change their order in the scene, which is particularly important when rendering transparent objects. 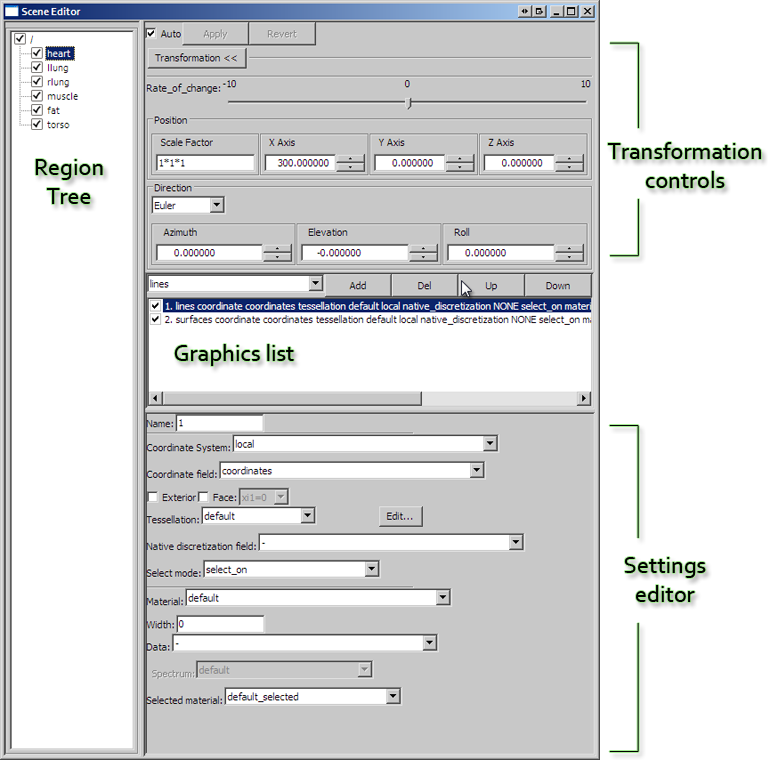 As a quick example of what can be done with this editor, select the lines setting in the settings list (shown selected below), and un-tick the check box. The white lines along the edges of the cube will disappear in the graphics window. Similarly, you can choose whether to show the cubes surfaces or the node numbers using the appropriate check boxes. You will notice that as you select settings (such as surfaces) in the settings list, their properties will appear in the settings editor below. Using this editor you can change a large number of the display properties of objects in the scene. There are many more important functions to this editor window which will be explained in more depth later.